Pretty Little Liars returns to ABC Family tonight with an all new Tuesday July 14, season 6 Episode 6 called “No Stone Unturned,” and we have your recap and spoilers below. On tonight’s episode, the girls zero in on Lesli [Elizabeth McLaughlin] as their hooded tormentor, but they want proof before going to the cops. Meanwhile, Emily [Shay Mitchell] receives an unexpected offer from a friend; and Spencer’s [Troian Bellisario] family push her to make a big decision. On the last episode, Mona returned to Rosewood in a very fragile state as she had to answer to the police for faking her death. Matters only got worse when she was confronted by Lesli’s sister about Lesli’s inadvertent involvement in Mona’s plot. Hanna was determined to help Mona out, not only to reassure her she was safe from Alison but also to try and repair Mona’s friendship with Lesli. Emily tried to help Sara with her troubled home life by encouraging her to explore the possibility of emancipation. Spencer, on the other hand, found help from someone from her past. Did you watch the last episode? If you missed it, we have a full and detailed recap right here for you. The season 6 episode 6 of PRETTY LITTLE LIARS is going to be really exciting and we’ll be recapping it for you right here. Tonight’s episode of Pretty Little Liars kicks off with Spencer at Emily’s house – she fills her in on her theory that Mona’s friend is Leslie Stone. She explains that Leslie and Mona were together in Radley. Leslie was Bethany Young’s roommate at Radley and she is trying to get revenge on the liars because they think that she killed Bethany. Hanna and Spencer are plotting to catch Leslie in the act, Emily thinks they are being a bit over-zealous and says she has to go to her therapy appointment. On her way to therapy she passes Alison’s house. Alison’s dad is outside and freaking out – he demands to know if Emily saw someone put a note on his car. Hanna tells her mom and Caleb that she is going to Philly. She lies and says that Spencer has an appointment. Caleb wants to drive her, but Hanna rushes out and says she and Spencer will be fine. At Emily’s house, Sara is getting ready for her first day at work for Caleb. Emily puts ointment on her new tattoo for her and wishes her luck after she helps her pick out her outfit. Spencer is getting ready to leave for Philly and there is a knock at her door – its Dean. He says he just stopped by to drop off a book for Spencer, his sponsor gave it to him years ago. He asks Spencer how she has been sleeping since she quit taking drugs, she confesses that it’s not going well. Spencer explains her Valedictorian predicament. She has incompletes in every class and doesn’t think that she deserves it, but her parents and the principal are pushing her to make the speech. Meanwhile at Caleb’s office, he is going over some stuff with Sara. Sara wants to talk about Alison though, she wants to know if Alison knows who “A” is. Caleb explains that he knows just as much as she does and the liars don’t “let him in.” A girl named Nicole stops by the coffee shop, she tells Ezra that she is looking for Emily – they met on the Habitat for Humanity trip. In Philly Hanna convinces a valet driver to give her the keys to Leslie’s car. She and Spencer steal her ar so that they can go through it and look for clues. While they are investigating, they find a set of wirecutters and like 10 pairs of fake glasses. They pop the hood and find four animal cages. Spencer reads the boxes and realizes that they are big enough to fit the liars inside of them. Aria runs in to Clark at the junkyard where she got a picture of “A”’s shadow. She lies and tells Clark that she is looking for her tripod. While she is snooping around the finds a doll that looks just like her, with a pink streak in its hair, and a knife stabbed through its head. Emily meets up with her friend Nicole at the coffee shop, Nicole explains that they are taking another Habitat Humanity trip – this time to Thailand. Emily makes excuses and explains that she has a lot going on. Nicole convinces her to come along – and Emily asks if she can bring Sara with her. Spencer heads to Caleb’s office, but he is out – she waits awkwardly for with Sara for him to come back. Spencer’s mom keeps blowing up her phone, and she explains her predicament to Sara about graduation. Sara thinks that she should give the speech and explain to everyone what it was like being kidnapped and everything that Spencer has gone through. Ezra shows up at Aria’s house to drop off her photo competition application, she left it at the Brew. He also wrote her a glowing recommendation. He sees the doll with the knife in its head lying on the floor in Aria’s bag. She lies and tells him that she did it for a photography project, he jokes that it is very disturbing. Spencer gets home late at night from Philly and Dean is sitting outside and freaking out – he is furious that Spencer didn’t show up to the AA meeting. He was worried about her, Spencer apologizes and invites him inside. Dean tells her he has to go, and says he isn’t going to see her anymore because she has a boyfriend and every time he sees her he wants to kiss her. Emily gets home and Sara is freaking out and scrubbing blood off the floor – she was in a bike accident. Sara explains that a black car was following her down the street when she was riding her bike, and then ran her down. Emily shows her a picture of Leslie’s car, Sara confirms that it was the car that was following her. 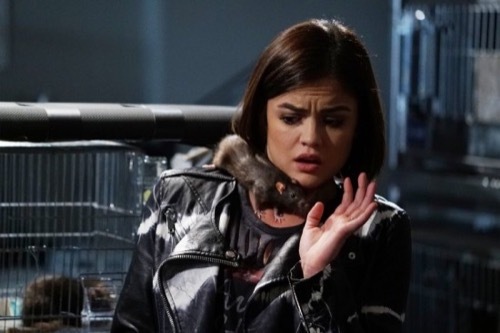 Hanna, Spencer, and Aria head to an animal lab where Leslie works after hours, they break in to snoop through Leslie’s desk. Hanna finds a wand like what is used by airport security, and it beeps while she holds it. Spencer takes the wand and waves it around her head and it beeps too. Leslie put chips in the liar to track them! Back in Rosewood Emily heads back to the coffee shop and tells Nicole that she can’t go to Thailand. Sara needs her, and Sara can’t leave the country without her parents’ permission because she is under 18 years old. Nicole thinks that Emily has feelings for Sara, but Emily insists that isn’t the case. At the lab Hanna, Spencer, and Aria are still snooping around looking for proof that Leslie is the one that kidnapped them. Hanna finds a room full of animals in cages. She has a flashback to when “A” locked her in the cage and she starts freeing all of the animals. Spencer yells at her to stop but it is too late. There is a raccoon that Hanna let loose, and it is growling at them. Hanna has cheese doodles in her purse, Spencer uses them to try and lure the raccoon back in to the cage. Suddenly someone turns off all of the lights in the lab – it’s Mona. She shines a flashlight on her face and asks the liars if they have lost their minds. Mona tries to tell the liars that she is on their side, but they aren’t buying it. Mona explains that Leslie hated Bethany she doesn’t want revenge for her death. Mona tells the liars that when Leslie was in Radley, Charles and Bethany both ran away together the night that Alison went missing – so Charles is still alive. The liars realize that Charles was just framing Leslie, to throw them off his trail. Emily heads home and Sara is sleeping in her bed, she tries to check sara’s neck to see if she has a chip in it and Sara sits up and starts kissing her.